With that direction in mind, one of the first things I like to do is choose the font we'll use for the series name. We new that it needed to be a bold and almost movie poster font. That led us to land on Trajan Pro. We then pulled together a mood/inspiration board to us with an overall look. Once we had all those pieces, we just brought it all together in the different formats in which the images would exist. Our volunteer team did a killer job of working together to take this series design from an idea to the final product. Here are some photos from the process. Early sketch in the process. First draft of the pastel version of the warrior king drawing. Closeup of 3D type on a banner. Teaser image for social media. 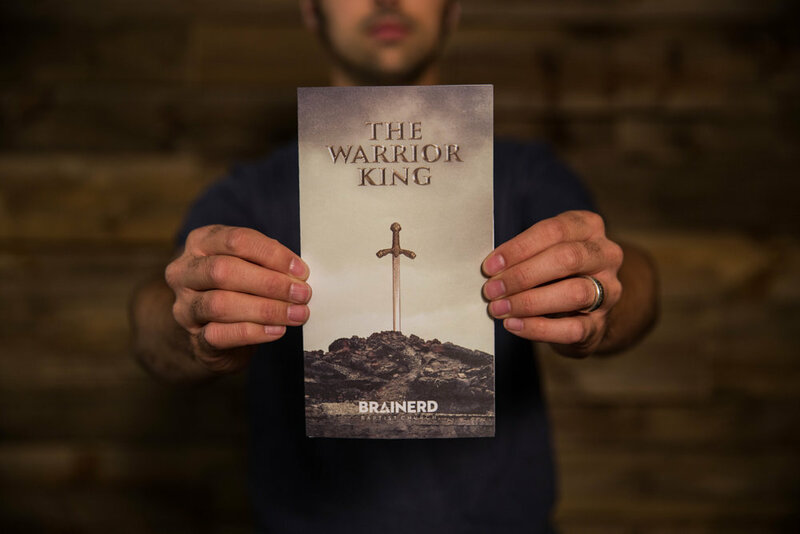 Want to use The Warrior King series artwork at your church? Get it here. This year our worship team wrote an original song for our congregation to sing as we observe Advent and celebrate Christmas. In the next couple weeks, we'll be release the full song as well as resources like chord charts and multi tracks to help other worship teams play this song. But for now, check out the video about how our team wrote the song. Want to be notified when the song & resources get released? Sign up for our email list. As part of our Advent resources, we were fortunate enough to partner with North Church in St. Louis to provide you and our own people with a daily Advent guide. As we take a slow walk to the manger together, it's important to be reminded of the hope, joy, peace and love that God gives to us in the coming of Jesus. This is a great, free tool to share with your congregation or use as a family with our Advent series or as a stand alone study. Our hope is that it blesses you and helps you experience the Christmas season in a deeper way this year.